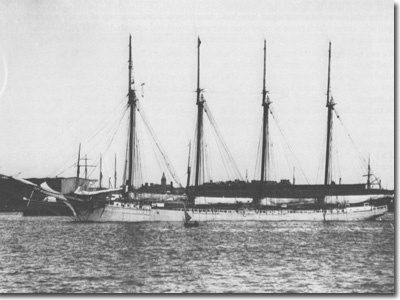 The multi-masted coal schooners Frank A. Palmer and Louise B. Crary collided on 17 December 1902 and their connected remains lie in the deep waters of the sanctuary. The two Maine-built vessels represent some of the largest 19th century coastal trading vessels. Each vessel is still loaded with 3000 tons of coal shipped from Virginia. 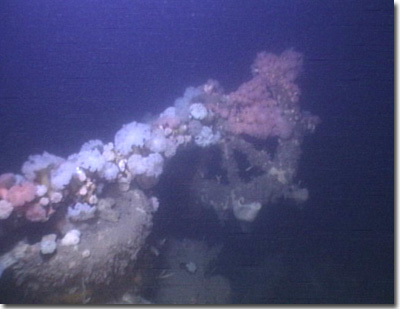 In 2002, the sanctuary and the National Undersea Research Center at the University of Connecticut (NURC-UConn), located Frank A. Palmer and Louise B. Crary with side scan sonar using information provided by shipwreck researchers Arnold Carr and John Fish. 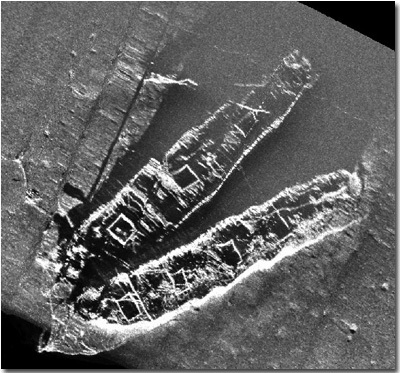 Side scan sonar image of the Frank A. Palmer and Louise B.Crary. Courtesy of NOAA/SBNMS and NURC-UConn. 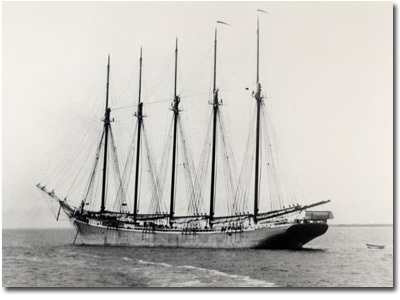 The 4-masted schooner Frank A. Palmer was built by Nathaniel Palmer in Bath, Maine in 1897 to carry coal between the Chesapeake Bay and New England. The wooden-hulled vessel measured 274 feet long by 43 feet wide with a 21-foot depth of hold. Historians believe that it was the longest 4-masted schooner ever built. Frank A. Palmer had an eventful career, surviving several collisions and grounding before its loss. Historical photograph of Frank A. Palmer. Courtesy of the Maine Maritime Museum. Three years after Frank A. Palmer slid into Maine's Kennebec River, the New England Shipbuilding Company of Bath, Maine launched the 267-foot long Louise B. Crary. It too was designed to carry coal between the Chesapeake Bay and New England. Historical photograph of Louise B. Crary. The two schooners collided on 17 December 1902 in Massachusetts Bay enroute from Newport News, Virginia to Boston, Massachusetts. Within minutes of the collision, 6 of the 21 sailors lost their lives when the schooners plummeted to the bottom. The remaining 15 sailors made it into Frank A. Palmer's lifeboat. During the following 4 nights, 5 more men perished from exposure in the open boat before being rescued 60 miles off Cape Cod, MA. The schooners sit upright in the sanctuary's deep water. The vessels' are in an excellent state of preservation, providing researchers a unique opportunity to explore two similar vessels at one location. The sanctuary visited the site in 2003, 2004, and 2005 with an ROV to gather imagery and assess its condition. 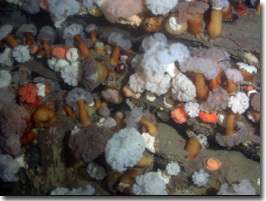 Frank A. Palmer's hull is covered with frilled anemones. Courtesy of NOAA/SBNMS and NURC-UConn. These expeditions explored Louise B. Crary's portside and bow with its partially intact bowsprit and Frank A. Palmer's stern cabin. The sanctuary will continue to investigate this site to learn more about the great coal schooners and their part in the New England coal trade at start of the twentieth century. Frank A. Palmer's helm is still mostly intact. Courtesy of NOAA/SBNMS and NURC-UConn. in port. Courtesy of NOAA/SBNMS and NURC-UConn. 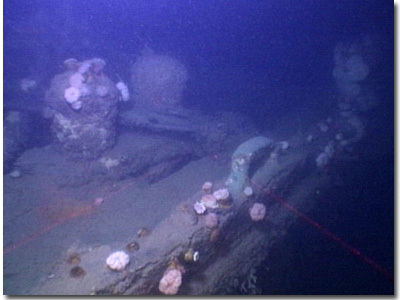 Louise B. Crary's bow is intact including portions of the bowsprit. NOAA/SBNMS, NURC-UConn, and the Science Channel. NURC-UConn, and the Science Channel.